True. But Mette Marit has got ties to Hardanger. Her grandmother came from Fosso near Norheimsund. She used to come here on holiday during the summer when she was a young girl. She still has some relatives living here. This is why the municipality of Kvam Herad decided to give her the hardangerbunad as a wedding present:). They would probably not have given her a hardangerbunad if she didn't have ties to the region. I believe Mette Marits hardangerbunad has something on it that shows that she's linked to the Norheimsund area. 2 black velvet lines that goes horisontal around 5-10 cm from the bottom of the 'skirt'. Thanks for the Mette-Marit's timeline, Larzen. I really like what she wore to her 2003 balcony appearance. She seems very groomed up & elegant. and her red bunad really suited her-up. Where is it from? 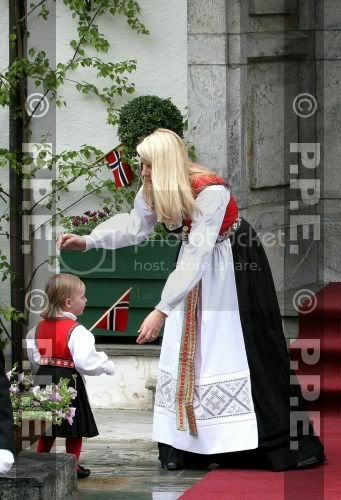 The bunad with the red waistcoat and white apron that she wore on Skaugum in 2003 is the Hardangerbunad. I'd say that it is only die hard bunad people who follow rule no.1 posted by Larzen. Most young women today choose not to use the head wear. I know I will never wear the head wear for my bunad. It is really ugly and unbecomming and I wouldn't be caught dead in it. I'd rather invest in a pair of ad-on-sleeves which belong to my bunad. And one more thing, I think most people who have bunads don't follow all the rules anyway. I also have a silver belt on my bunad, which according to tradition only were for married women, but I got mine when I was 15 and I am still not married some 12 years later. All in all, traditions do change don't they?? So today we will see King Harald, Queen Sonja, Crown Prince Haakon, Crown Princess Mette Marit, Princess Ingrid Alexandra, Prince Sverre Magnus and Marius. Norwegian fellows, do you see them on tv now? pics at this site, who feels like posting them here? Ingrid Alexandra is wearing her first bunad which matches her mommy's. btw, why isn't Marius joining the school parade like last year? 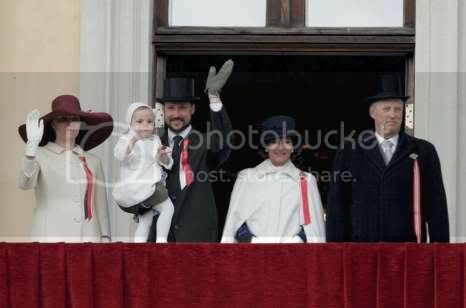 A pic from the balcony-Mette-Marit looks to have made a more "conventional" hat choice! 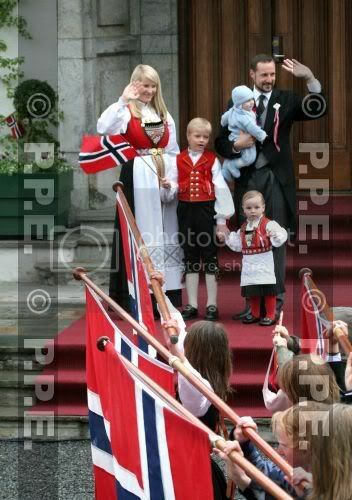 awww, ingrid looked adorable in her bunad! 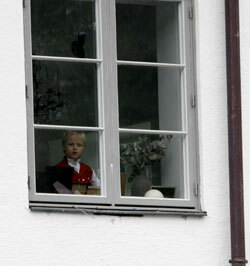 the same for mette marit, i think it's great to see royals wearing their very own traditional costumes. i was curious to how many bunads may mette marit have, since some of you normally mention that she uses this or that bunad. do they have all of them (one for every region)? what about ingrid? is this the first time she wears one? it's a pity she is no longer wearing the bunad for the balcony scene as sonja did last year. it would be a nice family photo of all of them wearing tha traditional costume.